Are you ready to sweat it out with this detoxifying treatment at IMC? During this 90 minute session the therapist will use hot towels, hot stones, and warm coconut oil leaving your body and skin fully rejuvenated. Choice of Swedish or Deep Tissue Massage with your partner in the same room! When you are really serious about working your body then you need someone who is serious about working on your body! This is a therapeutic treatment massage focused on relieving muscular pain and deep body stress! The original “quintessential” massage experience focused on stress relief, improved circulation and relaxation. This is the most common and most popular first time massage modality that is used to relax and rejuvenate! If you are unsure which package to go with, this is always a great start! This traditional Thai therapy is a beneficial addition to massage and bodywork. Steamed bundles of herbs are applied to the body to alleviate aches and pains, improve circulation, promote lymphatic drainage, relax muscles, and stimulate nerves. Herbs such as lemongrass, ginger, peppermint, and eucalyptus provide a relaxing and stimulating experience. The broad pressure of the compresses can allow work on areas that might be too sensitive for normal massage. After the session, you may take the bundle home for reuse within five days or as a luxurious herbal bath infusion. Come get the FULL experience from Indy Massage Co. with this power packed therapeutic start up! Twice as much the power for less than what it would cost for two individual sessions combined! Gentle spa massage focused on the needs of expecting mothers! Fully clothed massage focused on an assisted yoga stretching routine! Massage focused strictly for relaxation! Seated massage performed on a chair designed for massage! Graston Technique (GT) therapy is successful in treating all soft tissue conditions, whether they are chronic, acute or post-surgical. GT therapy can help you enjoy a pain-free life. Graston instruments enable the treatment of scar tissue during rehabilitation for a faster recovery and has a greater success at improving range of motion and eliminating pain. Please visit the link below for more information regarding this effective treatment. Reiki is a therapy often described as palm healing or hands-on-body healing in which a practitioner places hands lightly on or over a patient’s body to facilitate the patient’s process of healing. Reiki combines the Japanese and Chinese word-characters of “rei” (spiritual or supernatural) and “ki” (vital energy). Reiki heals by flowing through the affected parts of the energy field and charging them with positive energy. 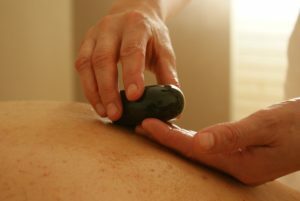 This technique of using heated stones dates back hundreds of years and can be an excellent way to loosen up the muscles so that the massage technique can be more penetrative to sore or inflamed muscles. If you suffer from chronically high levels of stress hormones, the soothing nature of this massage can balance the metabolism and calm the mind, helping to shed your stress and worry. Lymphatic drainage is a therapeutic massage treatment. The massage uses very light pressure and long, gentle, rhythmic strokes to increase the flow of lymph and reduce toxins in your body. Lymphatic drainage can: reduce the chance of you suffering from minor colds and viruses; it helps your body fight off infection, and speeds up healing and recovery from illness; reduces pain and swelling, reducing water retention; improves your skin texture by reducing swelling, and puffiness; Reduces leg swelling from chronic venous insufficiency. 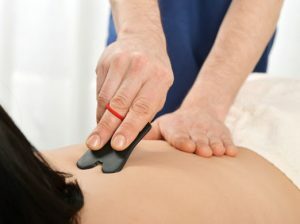 Active Isolated Stretching (AIS) is a technique that focuses on lengthening muscles and fascia. By incorporating this technique into your session, we can relax the muscle tissue with massage and place focus on lengthening it out with AIS stretches to restore healthy alignment and function to your muscle fibers. This combined approach helps reduce tension and improve range of motion which is key for injury prevention and care as well as performance enhancement. Please visit the link below for more details about this technique.